Djibouti (AFP) - Dwarfed by warships and giant cargo vessels, the small wooden boats that brave the dangerous crossing between the Horn of Africa and Yemen are a lifeline for the desperate thousands fleeing war. 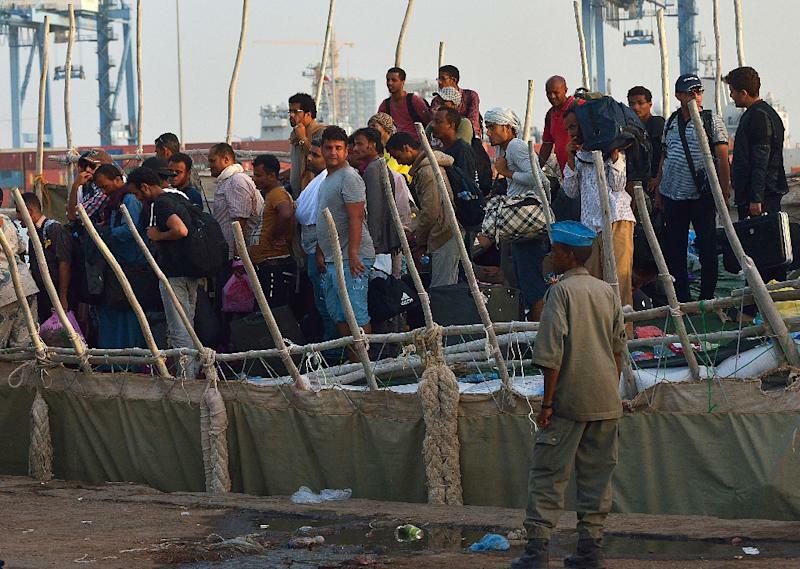 Each day they come from the Arabian Peninsula to Djibouti, crossing the waters of the Bab al-Mandeb strait -- the "Gate of Tears" in Arabic -- the key shipping channel of the Gulf of Aden. Djibouti, a tiny nation of over 800,000 people, is a haven for Yemeni refugees fleeing the air strikes that have devastated their country. In late March, a Saudi-led coalition began air strikes against Shiite Huthi rebels, after the insurgents, who are backed by ex-soldiers loyal to Yemen's former president Ali Abdullah Saleh, seized control of large parts of the nation. At its narrowest point, there are only some 30 kilometres (20 miles) between Yemen and Djibouti, a port that guards the entrance to the Red Sea and Suez Canal. 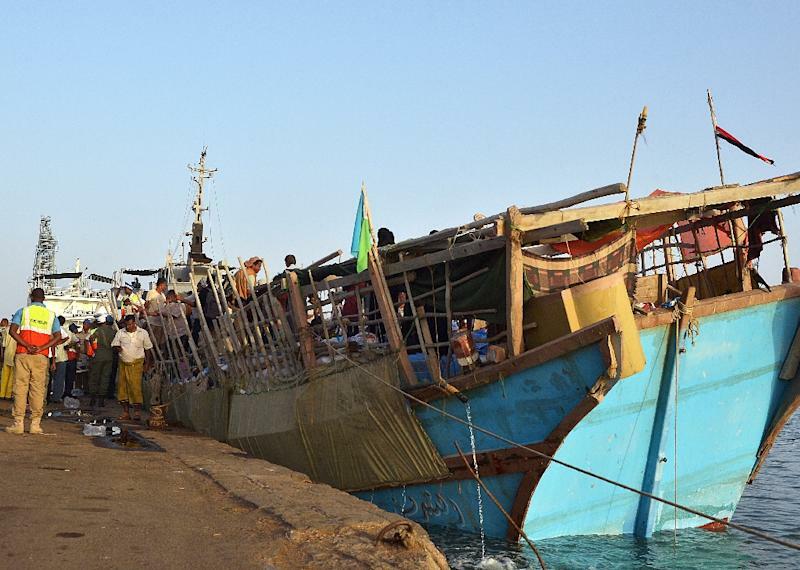 The fighting in Yemen has already sent thousands fleeing across the sea to Djibouti, with many more expected to make the crossing. "This is the only pain relief and rest I found, I need more drugs," he said. His right arm has been operated on, his left is bound in a makeshift splint. "I came here in transit, but I've been here now for 16 days and I can't leave... we need specialised surgeons, but there are none here," he said. The real estate businessman from the United Arab Emirates also ordered his company boats to rescue those trying to escape the war. But the needs are huge: the injured crowd into apartments, their wounds wrapped in bandages soaked in blood. 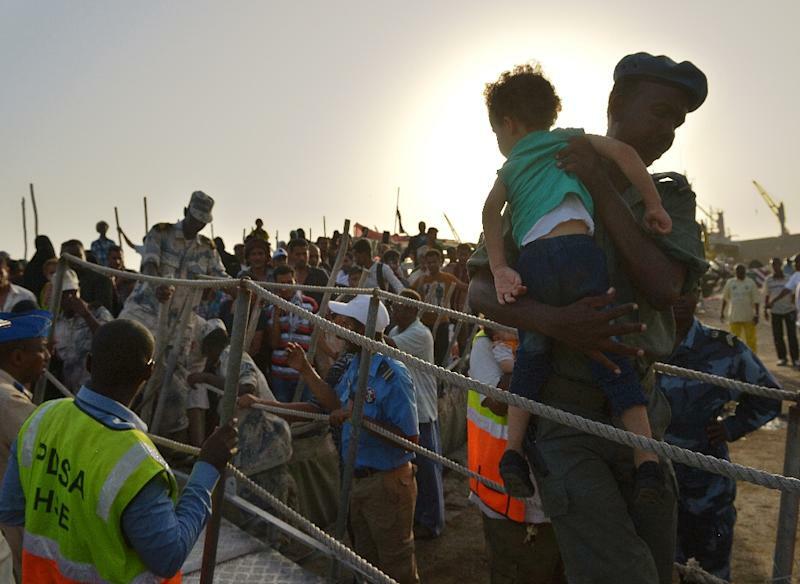 The UN expects more than 15,000 Yemeni refugees will arrive in the next six months in Djibouti, where the government says it will offer them what support it can. Sitting on her bed was a little girl of seven called Farrah, who had been hospitalised for over two weeks with a bullet lodged in her brain. "Her condition may deteriorate at any time if it (the bullet) is not taken out, but we have no neurosurgeon or MRI scanner here," said head doctor Qassem Abdul Awwad. In the same room an 18-year old woman, Widad, also had hopes of medical evacuation. She was wounded in the stomach during a Saudi bombing raid near the sports stadium in the southern port of Aden, but was stuck waiting for treatment. New arrivals come each day to the "Lootah Village," the half-built development serving as a refuge, but the place is already overcrowded. Taher Saleh, who manages the complex, said that with resources exhausted, they will have to stop sending ships to Yemen. "We could bring even more people in Djibouti, but if they are stuck here it is useless," he said.